In the summer of 2008, I came up with the crazy idea called a “memory moleskine.” The goal was to memorize the book of Ephesians before the end of the year. Since then, that Ephesian memory moleskine has resulted in 4,000+ people joining in. With a number of people desiring to do it again, I pitched the idea of memorizing the book of Philippians beginning in the New Year. Let’s face it. Memorizing Scripture can be a difficult discipline, especially memorizing long passages of Scripture. In our fast-paced lives of multi-tasking with any number of things vying for our attention, there is a real danger for the Word of God to get squeezed out of our daily lives. More than any other time, Christians need to partner together for the purpose of internalizing Scripture, encouraging one another to abide in the words of Christ, and remembering the weighty truths that center us in God’s work in our lives. 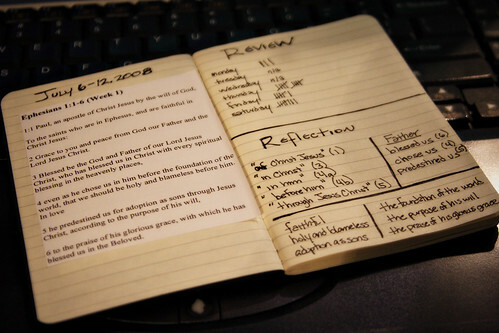 To do this, a system for memorizing Scripture has been created called the memory moleskine. Starting in 2011, I am beginning a project called P2R (Partnering to Remember). 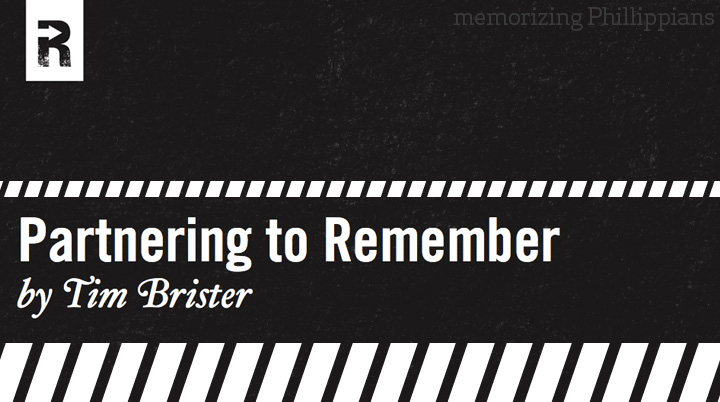 The goal is to memorize the entire book of Philippians by Easter Sunday (April 24, 2011) through partnering with other believers using the memory moleskine. Paul praised the church in Philippi for their partnership in advance of the Gospel, and in the spirit of that partnership, this project intends to bring Christians together for the deepening work of God’s Word in their lives. Simply put, I believe we should partner to remember. Using the Cahier moleskine, I have created a pocket-size notebook that provides a practical and accessible way to memorize Scripture. Through collaboration with The Resurgence, a customized PDF has been created for you to download with a week-by-week outline for memorizing the book of Philippians in 16 weeks using the English Standard Version (ESV) of the Bible. On one side of the moleskine you simply paste the week’s verses to memorize, and on the other side you write your reflections on the verses while indicating how many times you rehearsed them each day. Included in this PDF are encouragements and helps to memorizing and retaining Scripture from Donald Whitney, Andy Davis, and John Piper. The Cahier moleskine can be purchased either directly from Moleskine or from various bookstores such as Borders or Books-a-Million. My hope is that many Christians will establish a rhythm of remembering God’s Word together through a system that helps access Scripture wherever you are. So I encourage you to join me at the beginning of the New Year with a memory moleskine in your hand that God’s Word may be more treasured in your heart! 6. Jump in starting January 1, 2011!! !